CRAZY DISCOUNT! Was: $159.95 Now: $59.97! How annoying it is when bugs mosquitos and flies are buzzing around in your house especially during those hot days in summer! Besides, do you know they are vectors and can transmit a wide range of diseases? 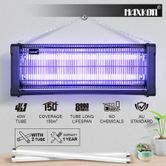 To protect your family from such threat, you will definitely need this Maxkon 40W Insect Killer Eco Mosquito Fly Bug Zapper Electronic Home Pest Control – Black. Featuring 2 replaceable 20w ultraviolet bulbs with a shelf life of 8000 hours, this bug zapper attracts all pesky flying insects into the device and kill them once they touch the extremely high-voltage metal grid. Perfect for domestic, commercial and industrial usage, as this cost-effective mosquito trap is capable of getting rid of all flying pests within its coverage area of 150 square meters. With that being said, the cleaning and maintenance is super easy as this eco pest control is equipped with a removable plastic tray for dead insects . 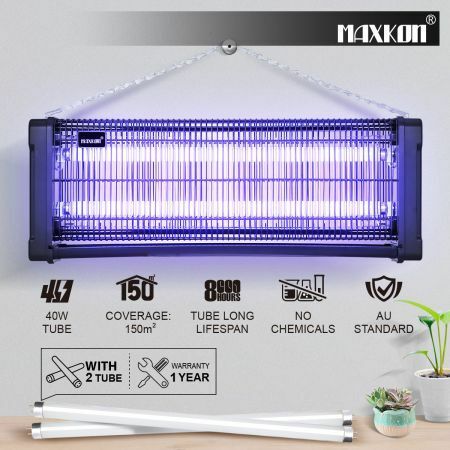 EFFECTIVE FLY & INSECT CONTROL - The MAXKON Bug Zapper features two high intensity 20w ultraviolet bulbs that attracts all pesky flying insects into the device and get them killed once they make contact with an extremely powerful high voltage metal grid. Get rid of all flying insects and bugs! SAFE & CLEAN - The removable plastic tray at the bottom of the unit collects dead insect, and is washable, making maintenance fast and simple. POWERFUL & LARGE AREA COVERAGE - Designed to spread light in all four directions, thus being extremely effective for a large area up to 150 square meters! Perfect for home, office, kitchens, restaurants, schools, hospitals or commercial and industrial use. Protects and prevents against annoying and disease-carrying flies and insects! SAFE - A mesh screen protects you and your family, preventing accidental contact with the electrical grid. How Does This Insect Killer Work? It utilizes the UV-A tube to attract insects and kill them upon touching the high voltage inner grid. WHY I Need This Insect Killer? You can enjoy your time without being bothered by those annoying insects! Provide your customers and staffs a comfortable business environment with his electronic bugs killer. Overall, the indoor and outdoor insect killer gives an environmental-friendly strategy for getting rid of mosquitoes from outdoor and your indoor parlor. This zapper contains extraordinarily successful UV (Ultraviolet) lights that attract mosquitoes and diverse dreadful little creatures. It's a perfect solution again mosquitoes and other insects in summer. - Attach the removable, washable plastic tray to the bottom of the unit. - Turn on the device, and eliminate bugs from your home. - When the tray becomes dirty, switch off the device, remove the tray, dispose of insects, wash, dry, and put it back.